If you've been following this blog long at all, you've probably gathered that I love to cook for people. A big table has been on my wishlist for years, and thanks to Craigslist, my dining room got a major update last week. In the course of about 72 hours, it went from hand-me-down Queen Anne eyesore to sleek Shaker sanctuary, from my least favorite room to my most favorite (though it still needs its walls painted). The new table can seat 14 with ease when extended, and it's got me daydreaming about get-togethers, game nights, and family gatherings. As great as it is to have a new dining room set, these lovely objects of wood are not ultimately what will make my home a welcoming place. 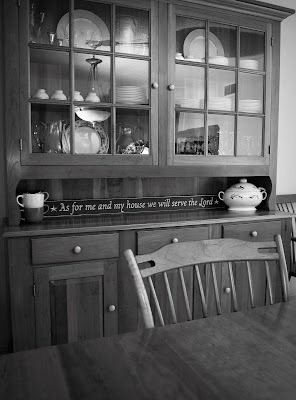 This series of articles from one of my favorite blogs, Passionate Homemaking, has been so helpful in reminding me of this, and giving me a renewed desire to be, not just a perfect Martha Stewart-type hostess, but a truly hospitable woman of God. What is hospitality, and who should we show it to? What's our motivation? and practical tips for making your home welcoming. I could probably take a pointer from the "plan simple meals" suggestion...might cut down on my typical pre-visit stressfest. I really believe being a good conversationalist is an acquired skill. For those of us who need a little help, I love these lists of questions...I can just see how they'd lead to meaningful discussion. What a helpful and clarifying thought that quote is! 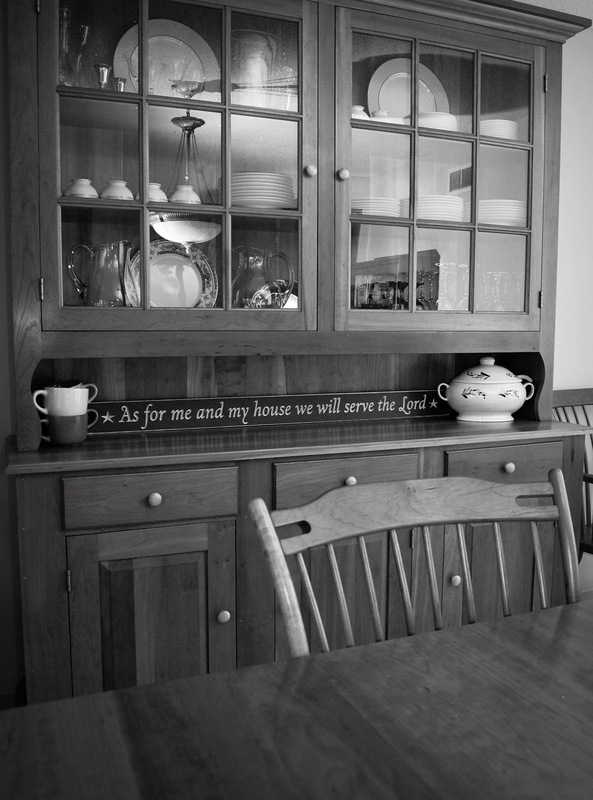 I love a cute apron and a perfectly set table, but when visitors leave our home, I'd like for them above all to feel that we loved them with God's gracious love. As we eat and drink and do all things to the glory of God, may our hospitality speak of His abundant grace to us.